This recipe started as mustard milk which evolved within a span of 3 - 4 months. It ended up becoming a Strawberry Cookie cream. One of my favorites right now. Edit: Feel free to sub Sugar Cookie v2 with Sugar Cookie v1. I didnt have it on hand when I created this recipe. Got my hands on v1 a week ago and it tastes pretty much the same as v2 (in this recipe at least). Maybe a liitle bit more creamy and buttery - but hey, that's a good thing! This recipe is the property of Ripstorm and released under the CC Attribution 4.0 license. You may not copy, derive or commercialize this recipe without following the terms of this license or the explicit permission of the creator. Mixed it with SC v1. Didn't like the cookie in the first few days. 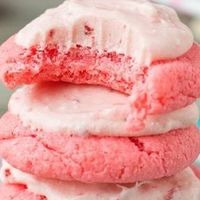 Now after 5 days, the cookie blends in with the strawberry and cream. Very tasty! Great recipe, well balanced and tasty. In my experience it is far better using SC v1 over v2 in this recipe. It needs at least a week steep for it to hit that OMG level, once it's there you won't be able to put it down. This is a fantastic recipe. I steeped it for a month and it's perfect. So good to see a local guy releasing bangers like this! This is one of the best strawberry vapes I have tried. It is in my rotation and an ADV! The cookie in the background is perfect and the strawberry just blends all together with everything so nice. This is a well balanced mix.